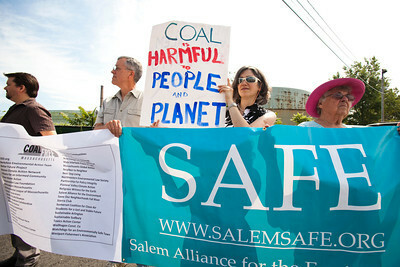 SAFE, Healthlink, Clean Water Action, and Sierra Club held a press conference at the Blaney Street pier today to announce the launch of a statewide campaign to decommission all of the state’s coal-fired energy plants. Today, Massachusetts has three coal-fired plants: Salem Harbor Station, which will be retired in June 2014; Mt. Tom in Holyoke; and Brayton Point in Somerset. Brayton Point, which is owned by Dominion Energy, is by far the state’s largest operating coal plant. Coal plants are the largest polluters in the Commonwealth, and contribute 25 percent of the state’s greenhouse gas emissions. Read more. This entry was posted in climate change, fossil fuels, Salem Harbor Station. Bookmark the permalink.